I'm on a business trip this week and just remembered I promised a winner from the OWH hop Tuesday! I'm so sorry this is late! Random.org picked #25 - Jen and I just sent her a note to get her address! Congrats, Jen, and thank you all for sharing your stories! They really humbled and inspired me! Hello friends! This week I'm traveling for work but I couldn't leave you hanging without sharing something creative! I've had fun with my new What's Up collection lately and made this card for the 2012 Gallery Idol competition. 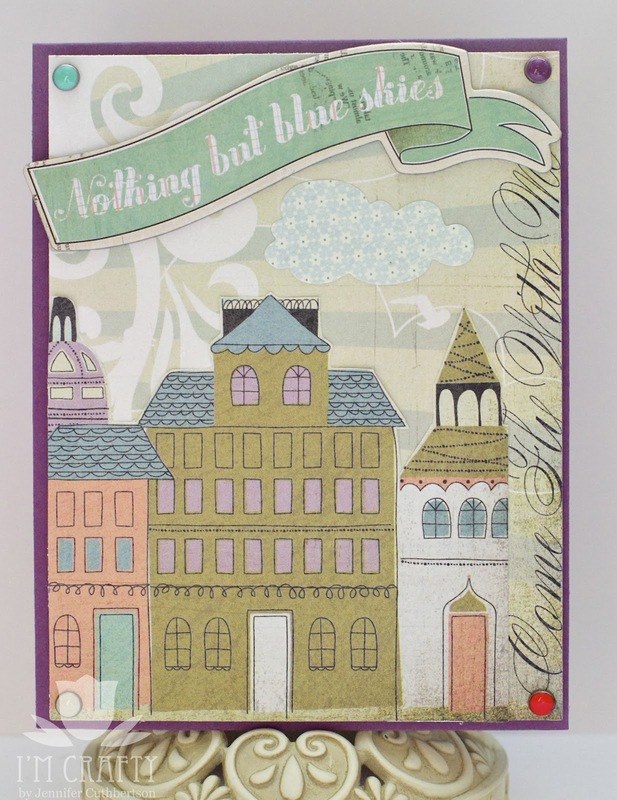 I used a background paper with clouds and the "come fly with me" phrase, cut out the buildings from another paper and layered them atop the cloud paper and then finished the card with a chipboard banner, cardstock sticker cloud, and some colorful brads. Thanks for visiting today and I'll be back on Friday with something for the new monthly challenge at The Craft's Meow! Hello friends! Today is another busy Saturday on the blog and this is my third post! If you're looking for my Waltzingmouse Sketch Challenge card or the OWH Blog Hop, please scroll down. I made this lovely tag for our Etsy Greetings Team wedding blog hop! I love being a part of Etsy and the Greetings Team is a wonderful team of artists who make handmade paper goods and greeting cards. Today we wanted to showcase some new wedding creations you can find in our Etsy Shops! If you're here from the Etsy Greetings blog, you're in the right spot. If not, head on over to get started! 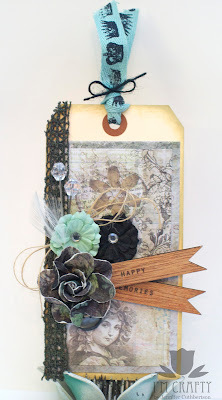 I made this tag using some new papers and embellishments from Prima - how gorgeous are they? The wooden banners say happy memories and there are even some feathers and some crystal stick pins tucked in behind those gorgeous flowers. Next on the hop is Anastasia! Head over to the Etsy Greetings Blog for the full list of participants today! When I heard about the blog hop and saw the new Circle of Honor set from Paper Smooches, I just had to have it! Even better, proceeds from the sale of this set benefits Operation Write Home! I started off with some patterned papers from Bo Bunny and some glitter tape from American Crafts (glitter that won't flake off...these tapes are brilliant!) 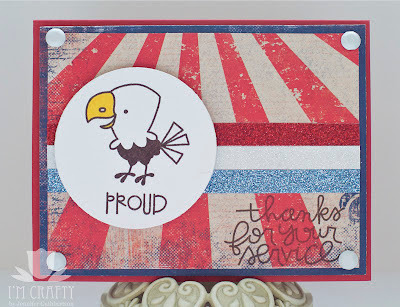 I stamped the eagle and colored him with my Copics and stamped the sentiment in the lower right. So, all of you who stuck with me this far are about to be rewarded...:) In honor of my 3 year blogiversary this month, I will send a brand new Circle of Honor set to one of you! Just leave a comment telling me why Memorial Day is special to you (and I'd love it if you also wanted to follow me but it isn't requred) here by midnight Monday 5/28, and I'll post the winner sometime on Tuesday! 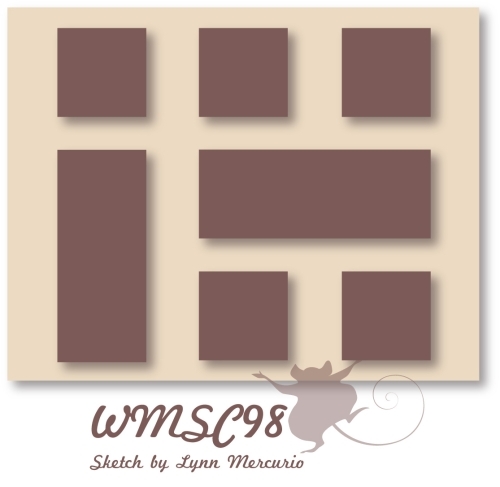 If it is Saturday then it must be time for a new sketch at Waltzingmouse Sketch Challenge! I just love this sketch from DT member, Lynn! I still had Sweethearts out from when I made my blog party card and I thought it would be perfect for a card for my hubby! Super, duper, extra, huge long story but we've been going through a lot of medical stuff the last couple of years and not only has he been a trooper, his strength has helped me through so much more than I thought I could deal with. He's my rock and I love him more than words can say! 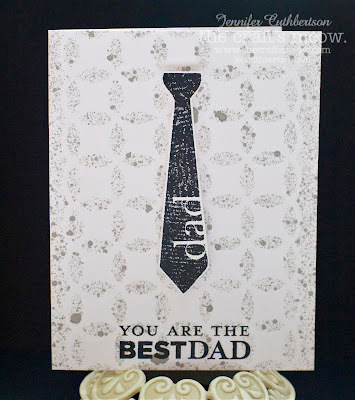 All of the paper elements and "do dads" came from the May Studio Calico kit and I stamped the sentiment and the hearts, cut them out, and added them to the card. Thanks for visiting today and I can't wait to see what you create with this sketch! Don't forget that a random participant will be chosen to win the stamp set of their choice! Hello friends! Today I'm happy to participate with this month's Papertrey Ink Blog Hop! Isn't the inspiration photo gorgeous?! 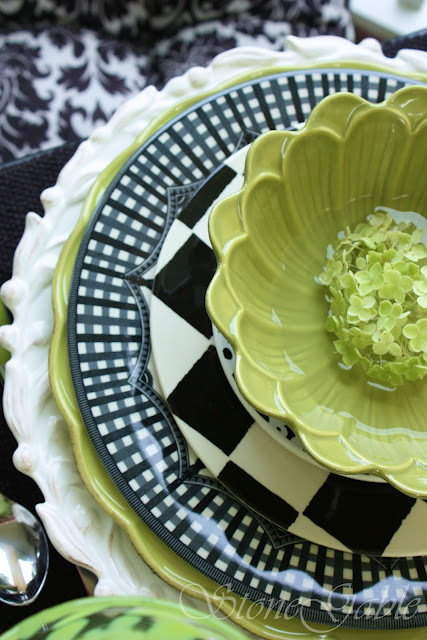 I love the geometric patterns and the greens with the black and white just pops! I started off with the checkerboard background from my brand new On the Farm stamp set and some green ink over a white panel. I stamped the sentiment and then sprayed the panel with some Mister Huey in gray. 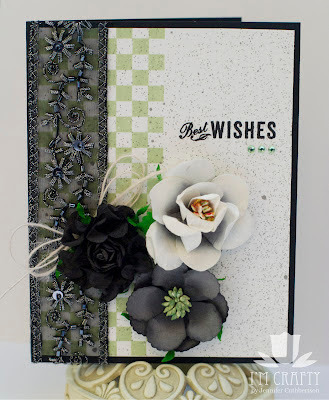 I adhered some gorgeous lace over the checkerboard and finished the card with some flowers and some gems. I started off with some new papers from Basic Gray, added some die cut felt clouds, and a chipboard hot air balloon. 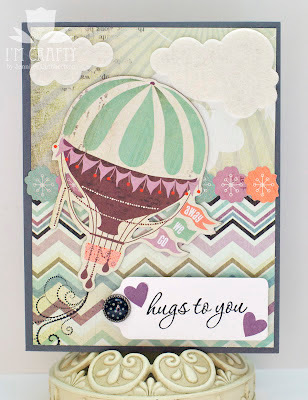 I stamped the balloon trail with a stamp from Flourishes and the tag with a sentiment and hearts from Sweethearts. Thanks for visiting today and I can't wait to see what you all create! Hello friends! What do you think of this month's release? Cracking, right!?! I am such a lucky girl to be able to work with such amazing images from such talented designers!! All of the sets we've previewed the past few days are now for sale!! Woo hoo!! Well, without further ado, let's get to the hop! If you're here from Jean's blog, you're in the right spot! 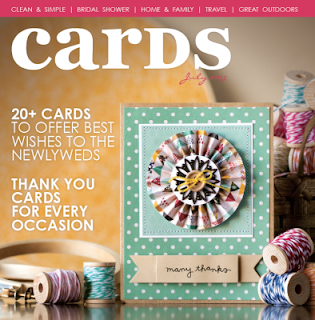 If you've just happened by, head to The Craft's Meow blog to get started! I made this card using "Typically Teen" and "Dads and Grads" and think they make such a great statement together! I cut a sheet of paper with a crossword puzzle pattern and stamped it with the splatter pattern stamp from "Typically Teen" using silver ink. 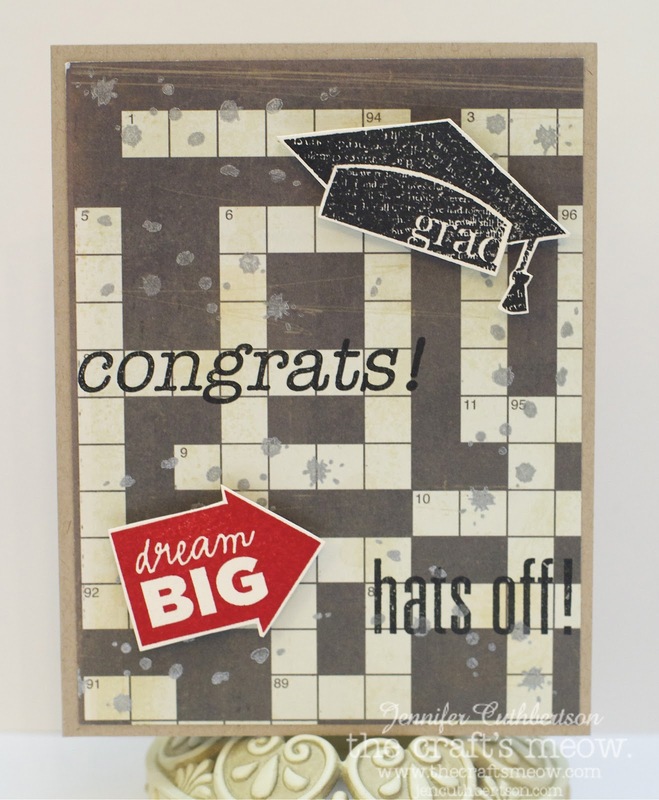 I then stamped sentiments from both sets into the crossword spaces, and finished the card with stamped images cut out and popped off of the card with foam squares. Well, I should let you hop on over to Jessica's blog because in order to be eligible for the big giveaway (all 6 new sets!! 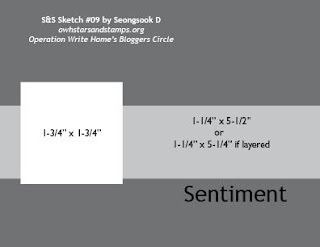 ), you need to comment on all of the blogs by 9pm PDT on 5/23! Good luck!! I have a quick post for today to share a card I made using the colors from this week's "Bright Bite" Tuesday Trigger at Moxie Fab world which just about perfectly match the colors in this week's Color Throwdown! 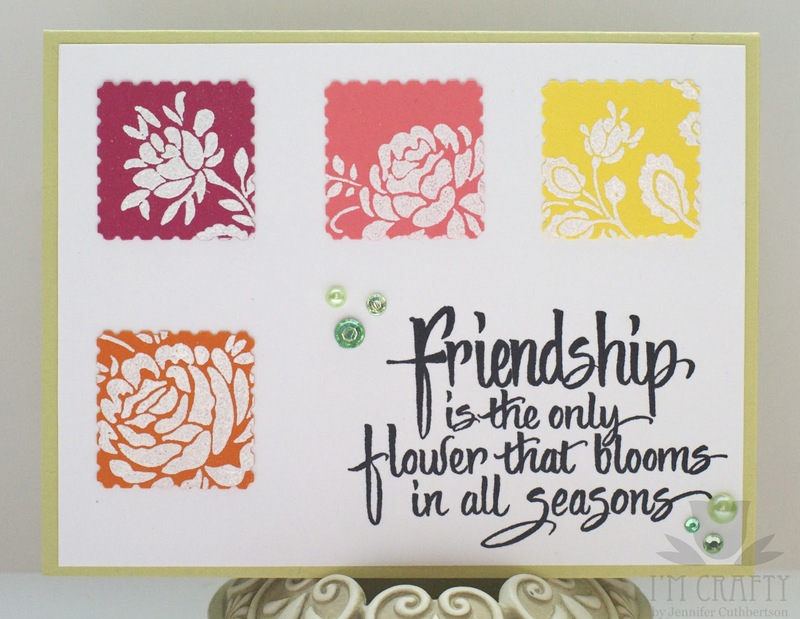 I started off with a green card base and then stamped a white panel with "The Only Flower" sentiment from Rubbernecker Stamps. 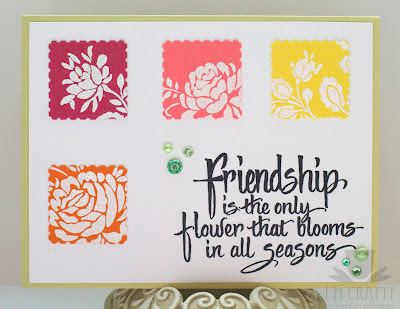 I stamped the "Floral Silhouette" and "Rose Silhouette" stamps onto different colors of cardstock and heat embossed them all using white powder. Once the images were embossed, I used a postage stamp punch to punch out different portions of the images and adhered them onto the card. I finished the card with some green gems. Hello friends! Today is the last day of previews for the amazing May release at The Craft's Meow! Have you been loving what you're seeing of all of the new sets?!? 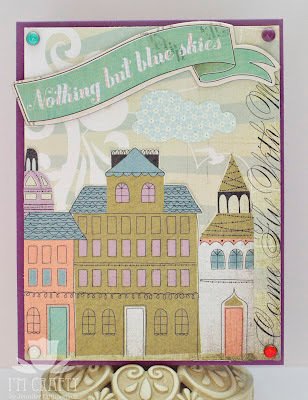 Today we have two more sets to preview - Retro Foundations and Typically Teen designed by Karen Baker! Don't forget to leave a comment back on the TCM blog for a chance to win both sets we're previewing today! I made this card primarily using images from Typically Teen but I threw in the graduation cap from Dads and Grads to finish it off. There are so many great images in Typically Teen which are perfect for cards for those younger folk! :) I love the streaks and the splatter background and the sentiments are the perfect size to go along with those broad brush strokes! I made this card using Retro Backgrounds and you've got to see all of the patterns in this set!! I started off by stamping one in silver ink on a black card base and I just love how festive it is! I die cut a little notebook page from vellum layered over white cardstock, spritzed it with some Mister Huey, and then stamped one of the greetings from the set on top. 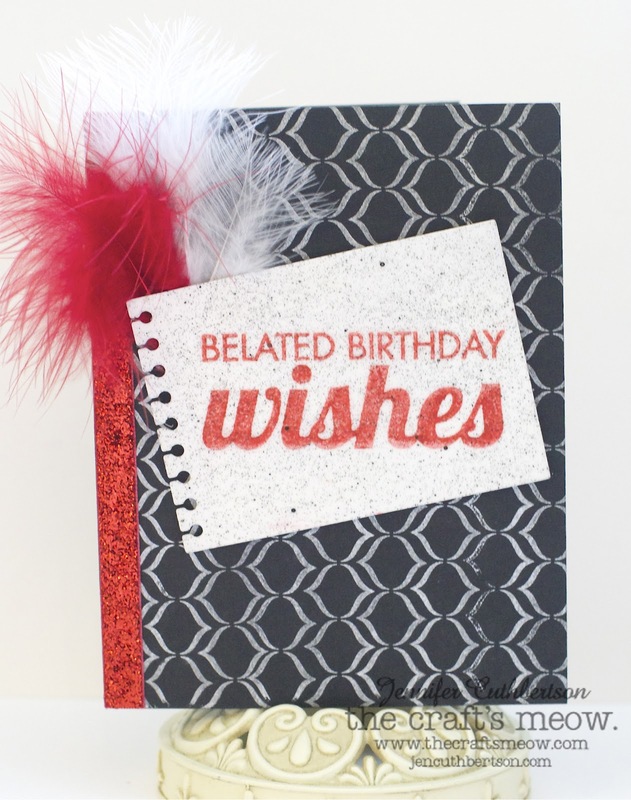 I finished the card with some red glitter ribbon and a few fun feathers. 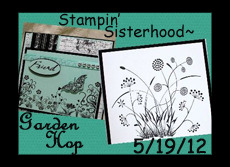 We are so happy you have joined us for our Garden Hop this month with Rubbernecker Stamps! If you've arrived from here from Jen's blog, you're in the right spot! If you've just happened by, head over to the Stampin' Sisterhood blog for the route! This month, we're having a word search again, so remember to collect words as you hop and then comment back on the blog by 5/25. A bonus entry will be given to anyone who announces our hop on their Facebook page or blog! Prize winners will be announced on Saturday! 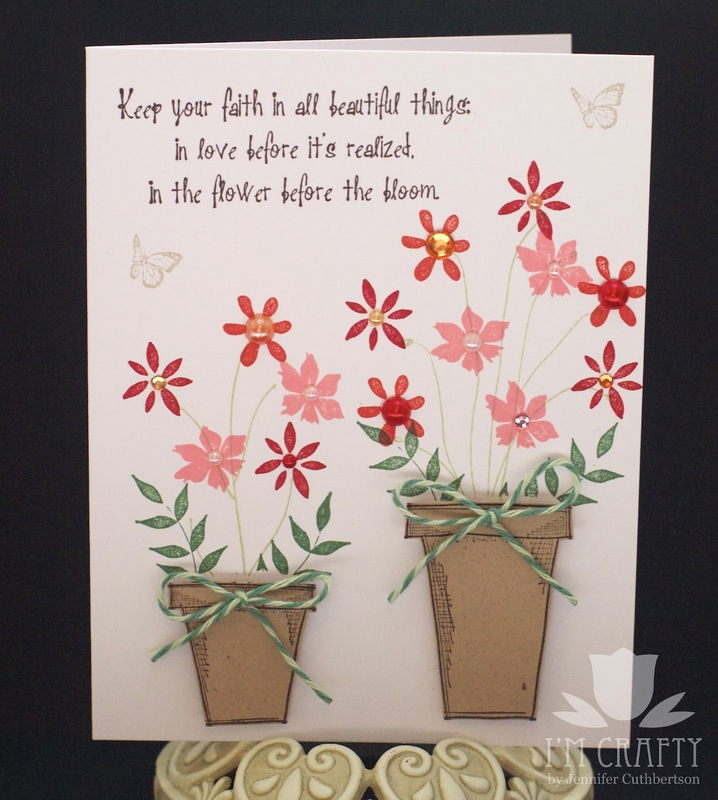 I started this card off with a white card base stamped with flowers from the Create a Garden II set - how pretty are they? Don't they look like they could just grow right off the card? I masked off where I wanted my pots to be and then stamped away! I stamped the pots onto some flecked kraft cardstock for a bit of a terra cotta look, and then adhered them using foam tape for some dimension. I finished the card with some twine, gems, and a sentiment from the Garden Phrase set. Thanks for visiting today and we'll see you back next month for another fun hop! 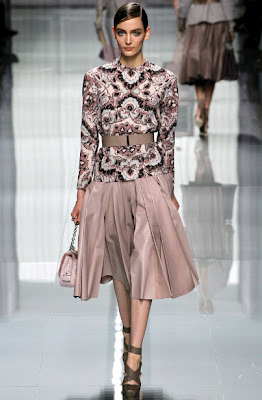 Off you go to Joan's blog for some more wonderful inspiration! Hello friends! Today I have another set to preview from Nina B. 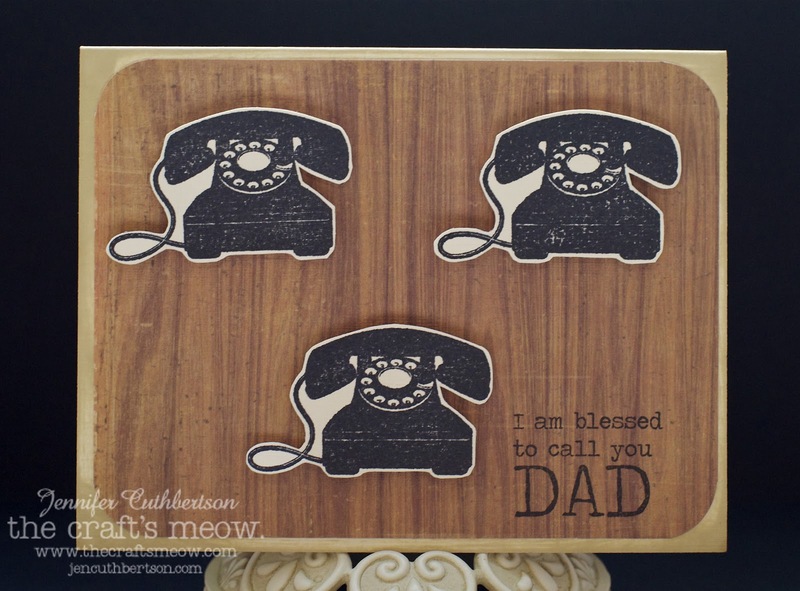 Designs for The Craft's Meow that you are going to LOVE! I already adore it and I've only gotten to play with it for a couple of weeks now. It is called Sew Happy, has matching nesties (I've ordered them and am dying for them to arrive), and is chock full of wonderful sewing images! Don't forget to leave a comment back on the TCM blog to win the set we're previewing today! 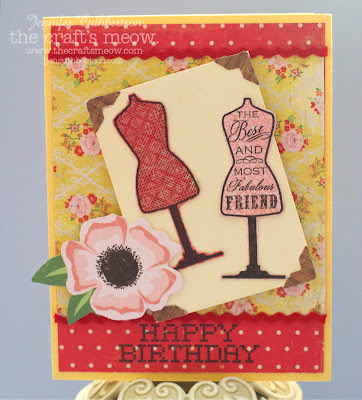 I used one of the sentiments and two of the dress form images to make this birthday card. I stamped the dress forms and hand cut them (see, I need my dies!! ), layered a couple of pieces of patterned paper, lined the center panel with some tiny, red, rickrack trim, and finished the card with a chipboard flower and some woodgrain photo corners. See you tomorrow with a preview of the stamp set that will be a gift with any $50 purchase this release. Fun stuff! Hello friends!! Today is a happy and busy Saturday for me here on the old blog (and IRL, more on that in a bit!) This is the first of three posts from me today and it is the start of another challenge at Waltzingmouse Sketch Challenge! 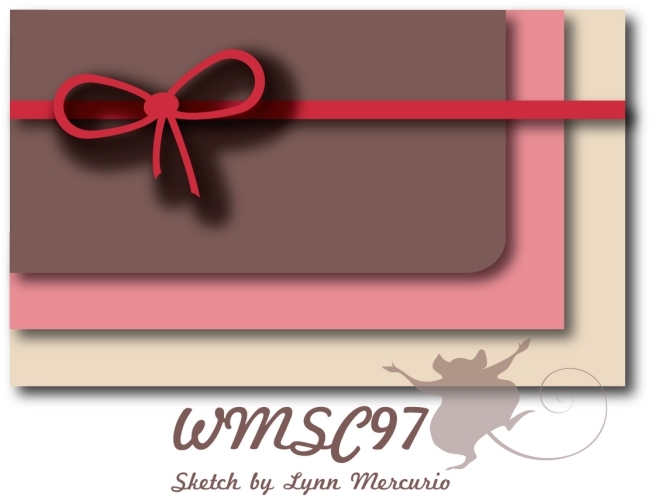 I was flummoxed for a bit from this sketch from DT member, Lynn, but am happy with how my card turned out! I figured I hadn't used Back in the Saddle in a while and it had a great mix of sentiments and images that I thought fit great with the sketch. The backing papers and embellishments are from the Sasparilla collection. Hello friends, welcome to day two of May release previews at The Craft's Meow! I hope you enjoyed all of the flowers yesterday and today we have something for the fellas! :) Don't forget to leave a comment back on the TCM blog for a chance to win the sets we're previewing today! 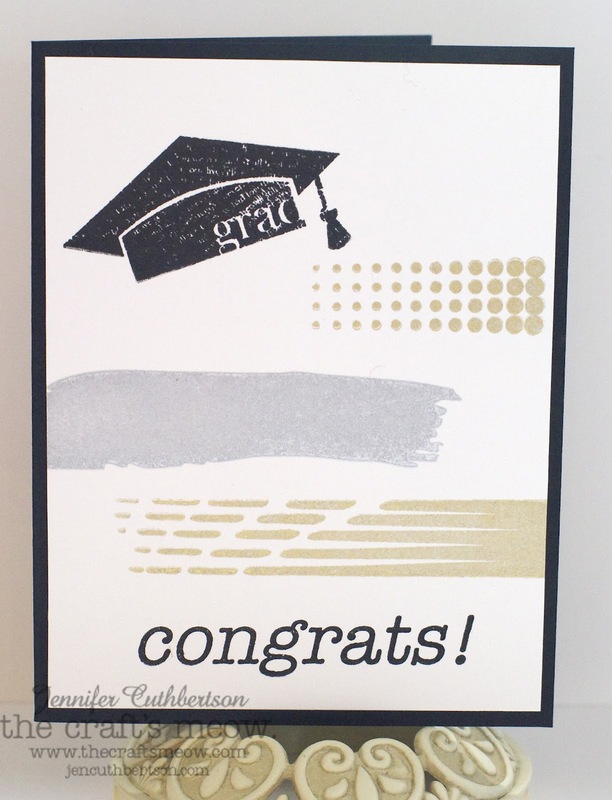 This first card is made from the Dad's and Grads set designed by Kaitlyn Ord. 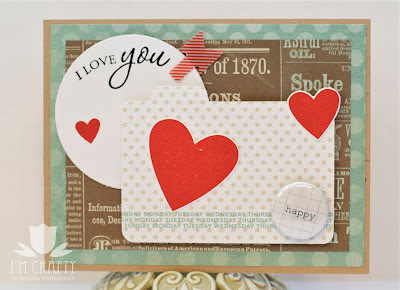 This set has a couple of wonderful images and even more wonderful sentiments! I started with a white card base that I tried to turn into a designer shirt front by using some Mister Huey and a Huey's Mask! I know my dad wouldn't wear this shirt but I've seen crazier walking around here in the city! :) I'll be linking this card to the Splatter Technique Challenge at Moxie Fab World, too! 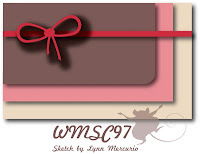 I finished the card with a sentiment and the wonderful tie image from the set. This tie is super with the "dad" and the newsprint background already embedded in the stamp! I can't wait to give this card to my dad! 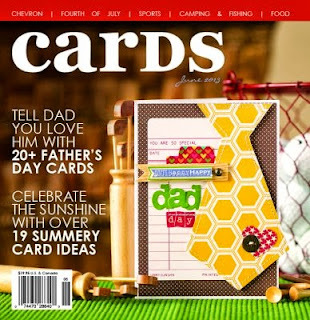 Since I already have a Father's Day card in mind, I will probably save this for his birthday. I adore how the sentiments from For My Dad match so well with the imagery in the set. Wonderful set design by Michelle Bertuzzi! 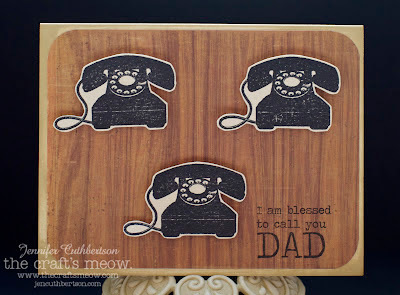 The minute I saw this sentiment, I thought it would be perfect with these little telephones and a bit of woodgrain background paper. I think he will love it! Hello friends! 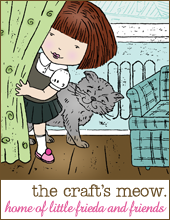 Today I 'm so excited to kick off four days of previews for the May release at The Craft's Meow! I'll be sharing projects featuring six new sets over the next few days and we'll wrap up release day with a DT blog hop on the 21st, the day the new sets will be available for purchase! Fun stuff!! 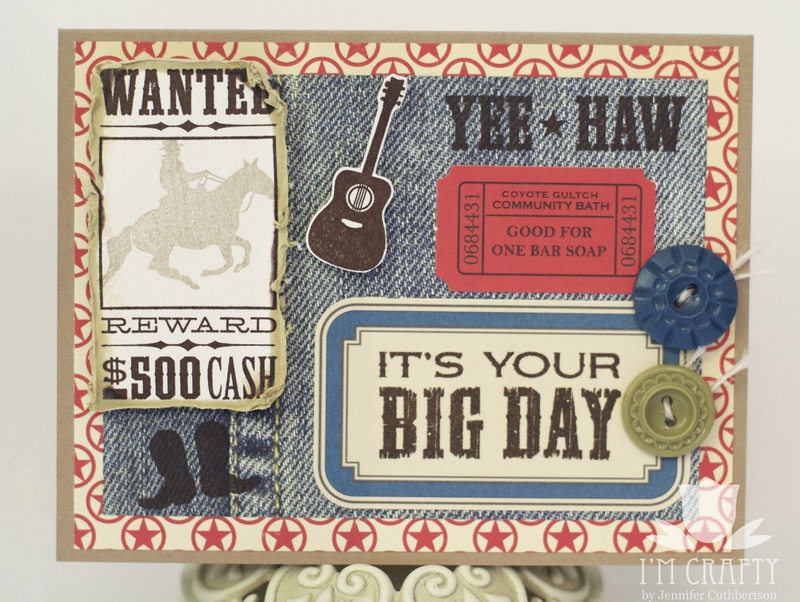 This month we're happy to have Annette Allen and Sharri Seffens as our guest designers, yay! I hope you can pop by their blogs to give them a big welcome! Also, don't forget to comment back at the TCM blog for a chance to win the set we're previewing today! I made this card with a gorgeous new set from Nina B. 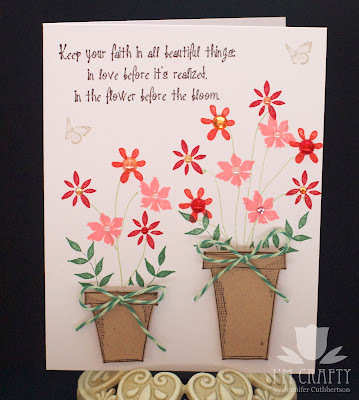 Designs - Flower Garden! Wow, are there some amazing images in this set! Trust me, you can create just about any type of garden you want to with these beauties! :) I started off with the tulip images because they are simply my favorite flower, ever! I stamped two tulips in red and the leaves in green on a white label. 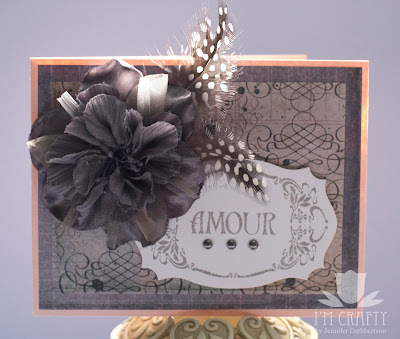 I just love the texture of the stamps - the text print is built right in so you don't have to do any stamp kissing! 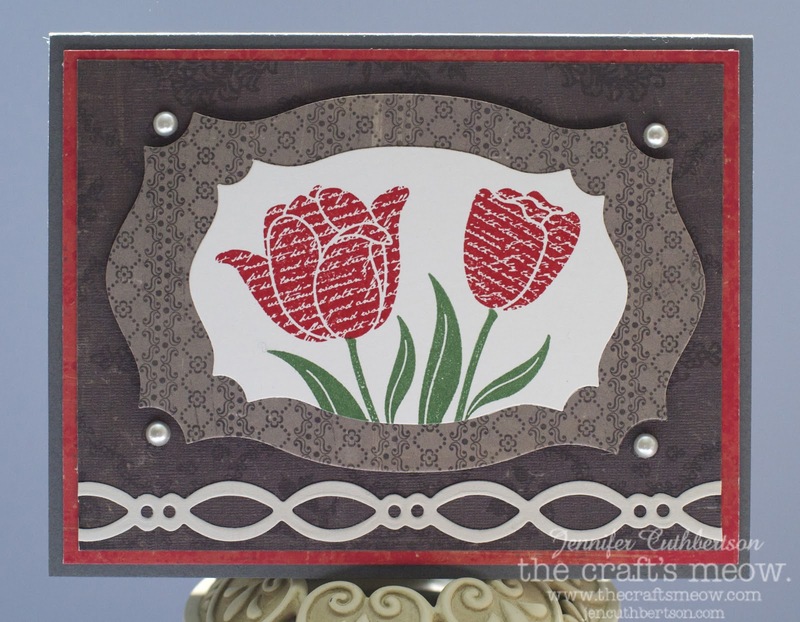 I used some neutral papers and a pop of red to coordinate with the tulips finishing the card with a border sticker. 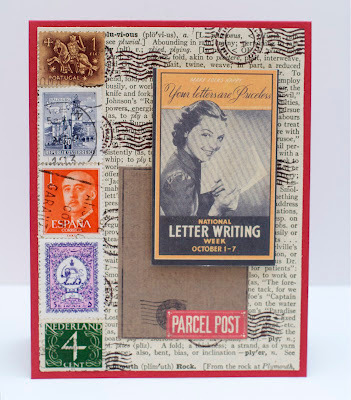 I started with a red card base, layered with a vintage dictionary page that I stamped with a postmark stamp from a the Opera set from Rubbernecker Stamps. I layered two die cuts on top using some foam squares for dimension and added some international postage stamps I found while on vacation last summer! I added the Netherlands and Spain in honor of two of our favorite trips and just thought the other three were pretty! :) I'm also linking this to the Postage Challenge at Moxie Fab World! Hello friends! 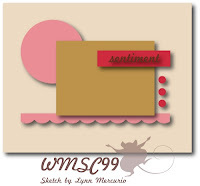 Today marks the beginning of a new sketch challenge at Waltzingmouse Sketch Challenge with this beauty from DT member, Lynn! I just love all of the layers and can't wait to see what you make with it! I'm also going to submit this card for the Moxie Fab World's Gingham Challenge! I've had these MME papers for a little while now and haven't really had a chance to use them and thought they matched the summery weather we've been having in the city this week. 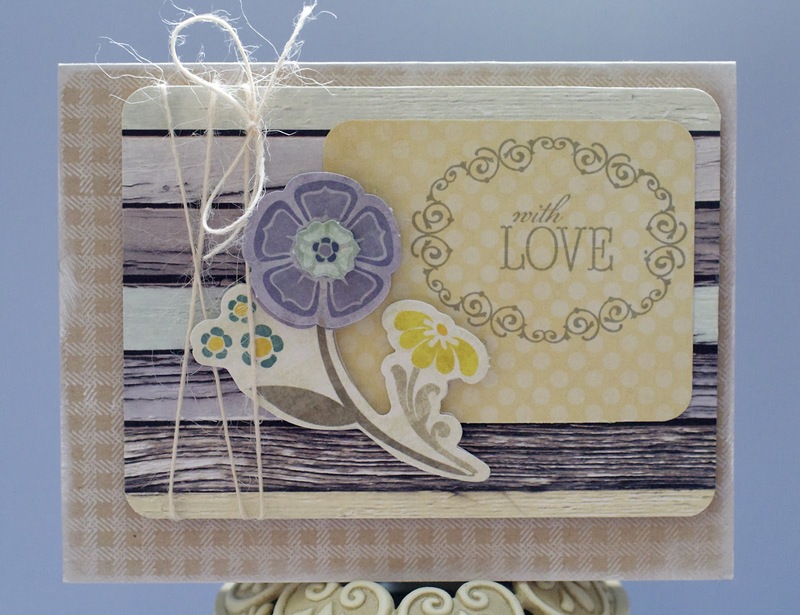 I started off with a kraft base that I stamped with one of the stamps from Gingham & Co. using white craft ink. I layered two coordinating patterned papers together and stamped the top one with the oval and a sentiment from Cameo to Go. I finished the card with some twine and a flower sticker that coordinates with the papers. Have fun with this one and remember, one random participant will win the WMS set of their choice!! I used the gray and pale pink color combo of the ensemble and used some patterned papers to replicate the look of the top. I finished the card off with a stamped label, a giant (amazing!) flower, and some fun feathers.